The dramatic landscapes of Barry Hilton express emotion and atmosphere with the use of intense colours and bold textural contrasts. His smooth, finely painted skies contrast with the heavy impasto techniques of the land as it appears in his highly coloured foreground. Barry builds up each composition in layers to give a remarkable, almost ethereal feeling of depth and intensity and that connects with the emotions of the viewer. Effective juxtaposition of differing shades defines each scene to stunning effect, especially when the light falls on to the heavy layer of paint which in turn scatters the light in many directions. The work does not duplicate the actual colours of the landscape, but rather conveys the creative imagination of a genuine and artistic talent. Barry was born in Manchester in 1941, Although painting and drawing always played a crucial role in his life, his formal training was in design - he achieved a first class B.A. (hons) degree in Ceramics and Tableware Design. It was not until he moved to Cornwall in 1979 that he first thought of painting as a possible profession. Here he entered a period of his life that had a profound influence on the remainder of his artistic career, meeting and working alongside a group of extremely active artists which led to considerable development of his artistic abilities. 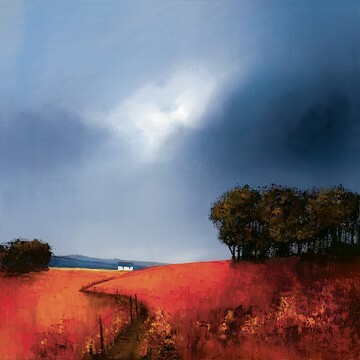 Barry continues to develop his style and technique, and has become one of the UK's most enduringly successful artists. "I consider my current work of landscapes and seascapes to be deceptively minimal and hope that the more one looks and analyses the picture the more one will see.